When the stresses and sounds of daily life are just too much my go-to escapes for some peace and quiet are the gym (during off-hours) and the mountains. 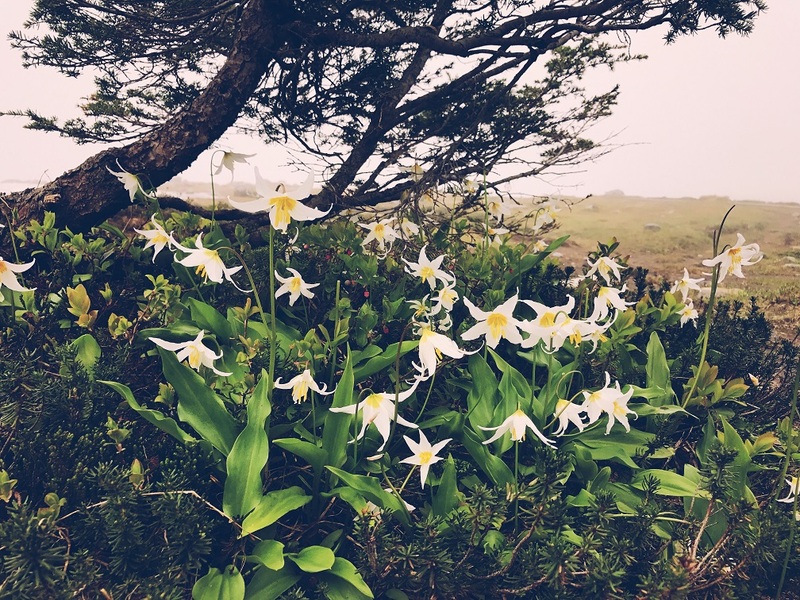 I’m usually a fair weather hiker so you won’t find me in the woods during a snowstorm however our corner of the PNW has plenty of mountain hikes where you can enjoy both snow and flowers in the middle of August. Pack a few extra layers for changing conditions and you can throw snowballs in short sleeves then enjoy a picnic lunch next to wildflowers on the edge of an alpine forest. I leave home with my head full of problems to solve but by the time I’ve driven away from the city and up a winding tree-lined road the buzz starts to fade and after a few hours wandering through fields and forests they seem very far away. 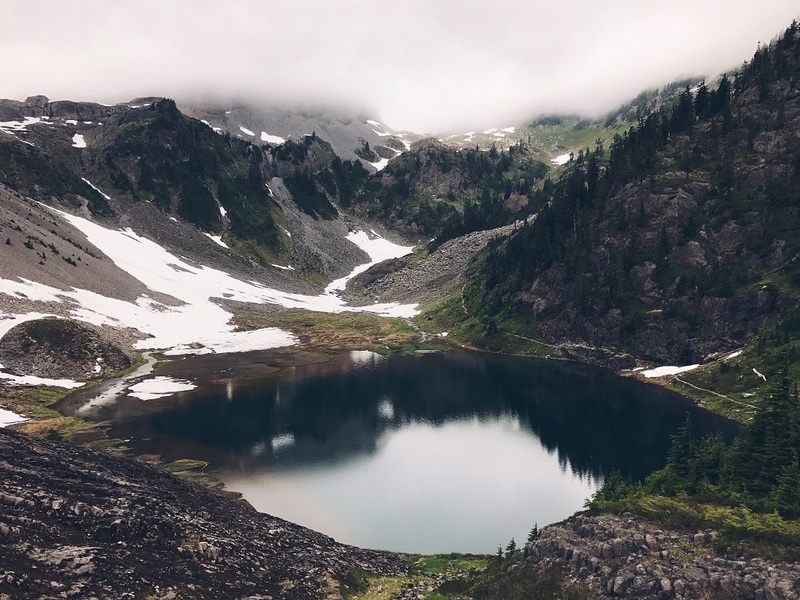 We left Bellingham on a warm August morning for the Mount Baker Highway and Artist Point but by the time we reached our destination the mountains were surrounded by fog and our trailhead was still covered by a few feet of winter snow. Instead we turned to pathways I usually overlook in my haste to find famous mountain vistas and the misty alpine air added a new layer of peace and quiet. If you’d like to explore, hike or snowshoe at Artist Point the Washington Trails Associaton website is full of information, maps and trail reports. Shades of Blue: Part 11 – Happy Halloween! Thanks, Mabel everywhere you look on this hike there is something beautiful to photograph. A welcome way to move past daily problems! It’s so gorgeous out in your neck of the woods. I always love visiting my brother (who lives near Seattle) and taking walks around his neighborhood. Your mountain shot is beautiful. ahhh – i am with you on the “off hours” for certain places! Exercise and nature–a marvelous duo. Hope that you are enjoying the change of seasons. Adore those wildflowers. We are in the middle of our dark/wet season, Sally but I’m looking for ways to appreciate it. 😉 I hope you’re well and enjoying the holidays. That would be a go-to place for me, too, Lisa. So beautiful! How lovely to rediscover a place you feel you’ve known really well. Being out in nature is always a great panacea for me.